Summary: Intradural pseudoaneurysms arose in two patients as a result of arterial injury incurred during surgery. In the first patient, the pseudoaneurysm developed in the middle cerebral artery, at the site of vessel perforation during aneurysmal surgery. In the second patient, the pseudoaneurysm developed in the anterior communicating artery after removal of a tuberculum sellae meningioma. These aneurysms had small ostia and were successfully embolized with electrolytically detachable coils. The clinical features and the treatment of intracranial pseudoaneurysms are discussed. Traumatic intracranial pseudoaneurysms most frequently occur after blunt or penetrating head injury (1–3), but they also can be caused by iatrogenic arterial injury during surgical procedures, such as aneurysmal clipping (4, 5), tumor removal (5–7), bypass surgery (8), transsphenoidal surgery (9), and other neurosurgical procedures (10, 11). Although surgical treatment can prevent catastrophic intracranial hemorrhage, pseudoaneurysms are usually difficult to eliminate without sacrificing the parent artery (1, 3, 10). Recent advances in endovascular techniques, however, allow safe approaches to complicated intracranial vascular lesions. We report our experience with two iatrogenically caused intradural pseudoaneurysms that were successfully embolized with Guglielmi detachable coils (GDCs) with preservation of the parent arteries. A 34-year-old man was admitted to another hospital after acute onset of headache and nausea. 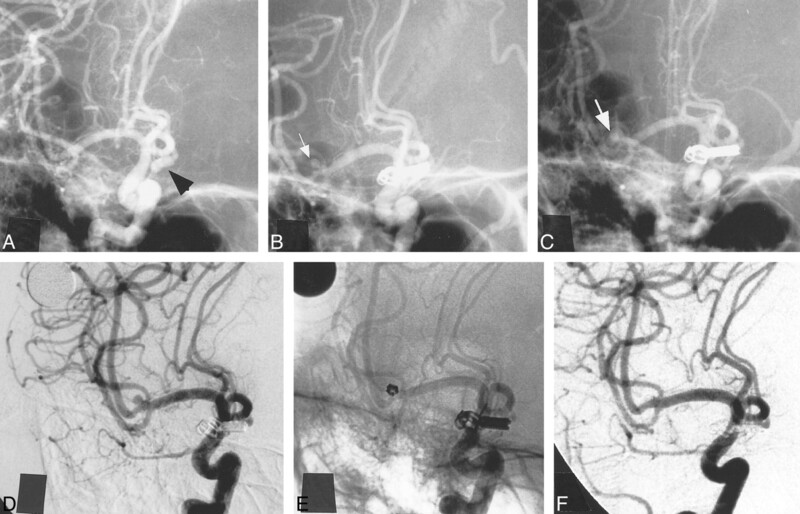 CT scans showed a subarachnoid hemorrhage, and angiography showed an anterior communicating artery (ACoA) aneurysm (Fig 1A). During surgery on day 0 to clip the aneurysm, the tip of the bipolar coagulator penetrated the right M1 portion just proximal to the M1-M2 bifurcation, and the artery bled. The tear was sutured with 10-0 nylon thread and coated with oxidized cellulose and Biobond (Yoshitomi Seiyaku, Osaka, Japan). Although the patient's postoperative clinical course was uneventful, angiography performed on day 22 showed a 2-mm pseudoaneurysm at the injured site (Fig 1B). By day 33, the lesion had enlarged to 3 mm (Fig 1C), and the patient was transferred to our hospital for treatment. A–C, Right internal carotid angiograms from the referring institution. Left anterior oblique views before (A), 22 days after (B), and 33 days after (C) clipping of a ruptured ACoA aneurysm (arrowhead, A). There were no abnormal findings in the territory of the MCA before surgery. 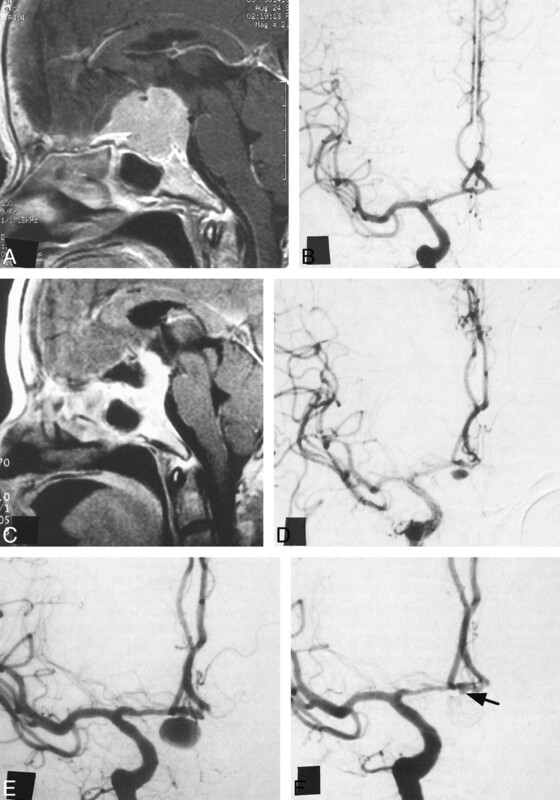 Follow-up studies showed a newly formed aneurysm in the MCA (arrow, B), which enlarged later (arrow, C). D, Right internal carotid angiogram, left anterior oblique view, 2 months after surgery, shows the 2.5-mm aneurysm in the right MCA. E, Left anterior oblique view of the nonsubtracted right internal carotid angiogram immediately after embolization indicates total obliteration of the aneurysm by delivered coils. F, Right internal carotid angiogram, left anterior oblique view, 3 months after embolization, shows continuous total obliteration of the aneurysm. At the time of admission, the patient's neurologic status was stable. Digital subtraction angiography disclosed a 2.5-mm pseudoaneurysm of the middle cerebral artery (MCA) (Fig 1D), which was somewhat smaller than it appeared on the previous angiogram. With the patient under local anesthesia and general heparinization, a 6F guiding catheter was positioned in the right internal carotid artery. Because of the acute angle between the long axis of the aneurysmal dome and the proximal artery, we could not insert a Prowler-14 microcatheter (Cordis Endovascular Systems, Miami Lakes, FL) with a Transend EX-14 guidewire (Target Therapeutics/Boston Scientific, Watertown, MA). Finally, we were able to insert the Prowler-14 microcatheter into the aneurysmal lumen using a double-angled 0.012-inch Terumo GT wire (Terumo Corporation, Tokyo, Japan). There was no reflux of blood through the microcatheter, however, and coil delivery seemed risky. The Prowler-14 microcatheter was exchanged for a Prowler-10 with a strong C-shaped tip. After we confirmed the reflux of blood, we placed two coils: a GDC-10 soft 2-mm helix × 4-cm long and a GDC-10 soft 2-mm helix × 2-cm long (Target Therapeutics/Boston Scientific) (Fig 1E). These coils completely occluded the aneurysm without incident. Angiographic follow-up 3 months after the endovascular procedure revealed no recurrence of the pseudoaneurysm (Fig 1F) and no migration of the coils. The patient has been neurologically normal and has not experienced hemorrhagic events during 6 months of follow-up. A 61-year-old woman was admitted to our hospital with impaired right visual acuity. MR imaging disclosed a 3-cm tuberculum sellae meningioma encasing the ACoA (Fig 2A). Angiography showed elevation of the right A1 segment and occlusion of the left A1 segment (Fig 2B). A left frontotemporal craniotomy was performed, and 70% of the tumor was removed (Fig 2C). The ACoA and bilateral A1 and A2 segments were exposed after tumor removal, but no lacerations of the vessels were seen. Postoperatively, the patient's visual field deteriorated and the patient was disoriented because of multiple cerebral infarctions. Angiography performed 1 month after surgery revealed no clear cause of the infarctions but did show a newly developed 3- × 5-mm ACoA pseudoaneurysm (Fig 2D). Two months after surgery, angiography showed enlargement of the aneurysm to 6 × 8 mm (Fig 2E), and the patient underwent immediate endovascular treatment. With the patient under general anesthesia and heparinization, we advanced a Prowler-14 microcatheter with a Transend-10 guidewire coaxially in a 6F guiding catheter positioned in the right internal carotid artery, but it could not be inserted into the right A1 portion. We then advanced a Rapid Transit microcatheter with a moderate C-shaped tip to the right A1 portion with a Transend EX-14 guidewire and placed it in the aneurysm with a double-angled 0.012-inch Terumo GT wire. Initially, we placed a GDC-10 soft 6-mm helix × 10-cm long coil. In all, six GDCs with a length of 65 cm were placed in the aneurysm. Postprocedural angiography showed almost complete obliteration of the aneurysm with only a small remnant near the orifice remaining (Fig 2F). A, Preoperative contrast-enhanced T1-weighted MR image sagittal view, shows a 3-cm tuberculum sellae meningioma encasing the ACoA. B, Preoperative right internal carotid angiogram, anteroposterior view, shows elevation of the right A1 portion and occlusion of the left A1 portion, but no aneurysms. C, Postoperative contrast-enhanced T1-weighted MR image, sagittal view, shows 70% removal of the tumor. D, Right internal carotid angiogram, anteroposterior view, 1 month after surgery, shows a newly developed 3- × 5-mm aneurysm of the ACoA. E, Right internal carotid angiogram, anteroposterior view, 2 months after surgery, shows a 6- × 8-mm aneurysm that enlarged progressively. G–J, Plain skull radiographs, anteroposterior (G, I) and lateral (H, J) views, immediately (G, H) and 4 months (I, J) after embolization. The position of the coils remains stable. The patient was transferred to a regional hospital for rehabilitation. 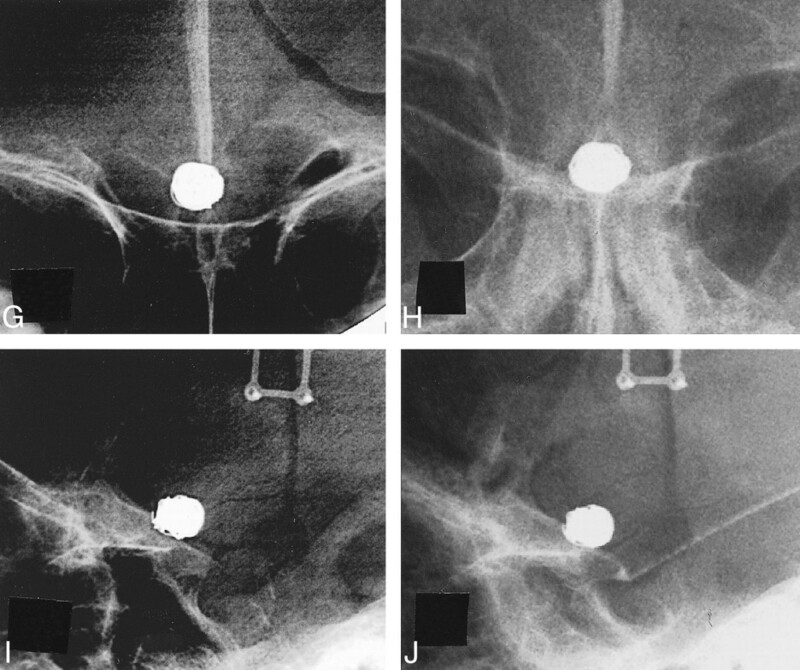 Although the patient's family did not agree to follow-up angiography, plain skull radiographs taken 4 months after GDC embolization showed persistent stability of the coils (Fig 2G–J). The patient had no subarachnoid hemorrhage, but she died of aspiration pneumonia 5 months after embolization. An autopsy was not performed. Traumatic aneurysms may be divided histologically into two types: true aneurysms and pseudoaneurysms (10). True aneurysms arise from partial damage to the arterial wall with an intact adventitia. Pseudoaneurysms are more common and develop when the entire arterial wall is lacerated and surrounded by a hematoma. In case 1, a tear occurred at the injured site during surgery. In case 2, the laceration of the ACoA was not seen during surgery, but removal of the meningioma that infiltrated the adventitia was thought to have injured the arterial wall (12). The pathogenesis of these two iatrogenic aneurysms was considered compatible with that of pseudoaneurysms. The natural course of traumatic pseudoaneurysms is difficult to define. Some of these aneurysms expand gradually and rupture in a few weeks or months, whereas others spontaneously shrink and disappear (1, 10). However, even if the lesion shrinks initially, it can reexpand thereafter (1). Miyazaki et al (6) described six traumatic aneurysms that disappeared spontaneously and that all showed one common angiographic characteristic: contrast medium was static in the aneurysm, even in the venous phase. Dario et al (10) reviewed 52 iatrogenic intracranial aneurysms and described their clinical course. These included 13 internal carotid-cavernous aneurysms and 39 intradural aneurysms. In the latter group, 16 aneurysms (41%) ruptured 5 days to 2 months after the causative procedure. The aneurysms in our patients showed rapid washout of contrast medium in the sac and a gradual increase in size. At first we observed the aneurysms conservatively and expected spontaneous thrombosis because of their small ostia, but it did not occur. Considering the difficulty in predicting natural courses and the high risk of bleeding, we decided that the patients should undergo definitive treatment. Although some authors have reported successful neck clipping of pseudoaneurysms (8–10, 13–15), very few pseudoaneurysms are suitable for clipping. Hayashi et al (4) described a pseudoaneurysm of the anterior cerebral artery (ACA) that formed 2 weeks after the clipping of a ruptured ACA aneurysm. The second operation was performed 4 weeks after the first one. Exploring the neck was difficult, as the whole dome of the aneurysm was separated from the arterial wall. Saito et al (7) clipped a traumatic aneurysm in the dorsal internal carotid artery, which developed and ruptured 2 months after the removal of a tuberculum sellae meningioma. However, postoperative angiography disclosed recurrence of the traumatic aneurysm, which was subsequently treated with permanent balloon occlusion of the internal carotid artery. In most pseudoaneurysms, it may not be feasible to obtain proximal and distal control and to find a neck for clipping (1, 3). In our patients, direct inspection of the pseudoaneurysms during the second operation would have been troublesome; coating materials were used in case 1 and residual tumor remained in case 2. Even if neck clipping is successful during surgery, permanent repair is not guaranteed. Trapping or occlusion of the proximal parent artery either with or without extracranial-intracranial bypass has been the procedure of choice for most pseudoaneurysms (1, 3, 5, 7, 9). Recently, however, treatment of intracranial pseudoaneurysms with the use of endovascular techniques has been described (3, 11, 16). Uzan et al (3) analyzed 12 cases of intracranial traumatic aneurysms, of which seven were intracavernous aneurysms, three were C1–C2 aneurysms, one was a petrosal aneurysm, and one was a distal ACA aneurysm. Nine of the 12 patients were treated with endovascular occlusion of the parent artery; detachable balloons were used in seven, and GDCs were used in two. In nine cases, the aneurysm was obliterated without permanent neurologic complications. In our two patients, however, occlusion of the parent artery would have produced ischemic stroke because of the anatomic location of the aneurysms or the poor collateral circulation. Few reports concern the intraaneurysmal embolization of intradural pseudoaneurysms. Lempart et al (16) treated 11 patients with pseudoaneurysms, of which nine were extradural and two were intradural lesions of the ACA. The aneurysms were embolized with GDCs with the intention of preserving the parent vessels. One of the ACA lesions was an acute 3-mm pseudoaneurysm of a callosomarginal branch, and both the aneurysm and the branch were occluded with coils. Embolization of an 11-mm ACA aneurysm with six GDCs resulted in a good clinical outcome, but angiographic studies were not shown. Quintana et al (11) used GDCs to embolize a wide-necked pseudoaneurysm of the basilar artery that developed after head injury. Fourteen months later, the aneurysm showed regrowth, and the parent artery had to be occluded at the base of the aneurysm. Our patients showed good clinical and radiologic results in the follow-up period. Unlike traumatic aneurysms that occur after head injury, the aneurysms in our patients had relatively small ostia. In this situation, the delivered coils were stabilized, absorbed the hemodynamic stresses, and promoted thrombosis and organization in the aneurysms. With regard to technique, manipulation of the microcatheter and the coils should be more meticulous for pseudoaneurysms than for nontraumatic true aneurysms. Catheterization of a pseudoaneurysm is not easy, because the ostium of the aneurysm is not located at the bifurcation (which is subjected to blood flow along the long axis of the proximal artery) but rather on the lateral wall of the parent artery. Moreover, the surgeon must pay close attention to the movement of coils during delivery so as not to penetrate the fragile wall of fibrocollagenous organization within a clot (1, 16). In our cases, firm matrices around the aneurysms, which consisted of Biobond in case 1 and tumor in case 2, might have made coil delivery safer, even though they had not prevented gradual aneurysmal growth. Coil embolization of pseudoaneurysms should be done carefully only when truly indicated. Unlike traumatic aneurysms that occur after head injury, the intradural pseudoaneurysms in our two patients had relatively small ostia. They were successfully embolized with Guglielmi detachable coils with preservation of the parent arteries. Coil embolization appears to be the treatment of choice for iatrogenic pseudoaneurysms with small ostia. We thank Hideki Wakimoto and Julie Yamamoto for help in preparing the manuscript. 1 Address reprint requests to Koji Tokunaga, MD.